The world of mobile search is about to get a bit more anonymous. Thanks to the fears over government surveillance and corporate tracking, Anonymous Search Engine DuckDuckGo continues to break its own search records. DuckDuckGo Search & Stories - Android app deliver the same functionality as traditional services such as Google but with the added promise that your IP address and identity will not be recorded. In June, Anonymous search engine DuckDuckGo had launched its app for iOS and Android and during recent update, DuckDuckGo's application for Android also integrated the Tor support. “Privacy is perhaps more important on mobile than on the web, and we haven’t had many private alternatives,” DuckDuckGo founder Gabriel Weinberg said. 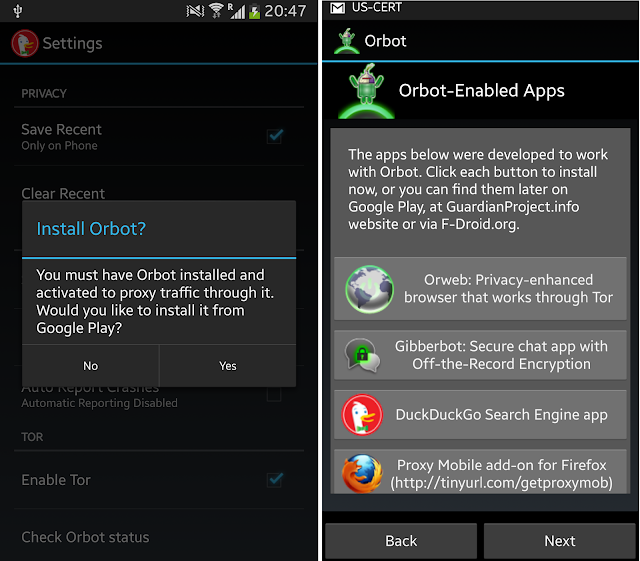 To enable Tor with DuckDuckGo android app, user need to Check "Enable Tor" from setting. It will prompt the user to install about application to anonymize the Mobile data communication. As a search engine, DuckDuckGo has some other great features as well, but the support of the Anonymous Tor network is certainly something that many Privacy Concern users will appreciate.